» Altair clones, reproductions, etc? Has anyone tried out any of the Altair clones or replicas? I noticed the Altair 8800 reproduction and the 680. The 8800micro is a bit less authentic, but looks both less expensive and more approachable. I also came across this ebay auction for a clone that looks like it just has more broken out to switches and LEDs. It'd be loads of fun to attempt building my own from scratch like this one, but honestly I just lack the time for that these days. I haven't messed with a MITS system before, but I've been kind of wanting to expand into it without the crazy prices of the original systems. Re: Altair clones, reproductions, etc? I'm still figuring out how to get my NorthStar Horizon shipped from Texas without breaking it. Mostly the blinkenlights and switches. I'm kind of liking that 'MINI 681' clone for that reason, since it has more of the bus signals broken out to toggle switches, it looks like you can toggle memory in as well out, and if not that, then the 680 over the 8800 I think. I would like to get something that actually has slots for expansion in case someday I do get some more time and can make my own cards. I could create the same experience using that homebrew z80 link and building up my own switch/LED panel. I've thought about doing something like that with a 68008, since I'm more familiar with that processor at this point, but the earlier processors would really be better examples, especially if toggling data in and out is a goal because of the 32bit instruction sizes of the 68k. Something more advanced than a digicompII, less than an Apple II, I guess. Now that I've been following all those project links, I'm thinking I should first construct my own terminal emulator and move up from there. I just want my IMSAI 8080's System Monitor Board to work. I've got the toggles rehabilitated and I can run simple programs on it, but I'd like to hook it up to a proper console. Mostly the blinkenlights and switches. I do think it's interesting just how *quickly* the "front panel era" of personal/kit/hobby computers passed. Maybe it was a reflection of the industry as a whole since the thing that made personal computers possible, IE, LSI semiconductor RAM, CPU, and peripheral chips, also made video terminals vastly cheaper than they were just a few years earlier, but as it turned out it was *pretty much* only the "Class of 1975" that came with full front panels. The Altair and IMSAI were certainly still being made and sold for a couple more years but just about every NEW computer that came out in 1976 included a boot ROM and some sort of console support. (Be that a serial port, a built-in keyboard/video interface, or for really cheap systems a keypad and hex display; the KIM-1 and friends are good examples of the latter.) Front panels are awesome, I'd be the first to agree, but it is a lot of wiring to build for something that hopefully you're not going to use that often. 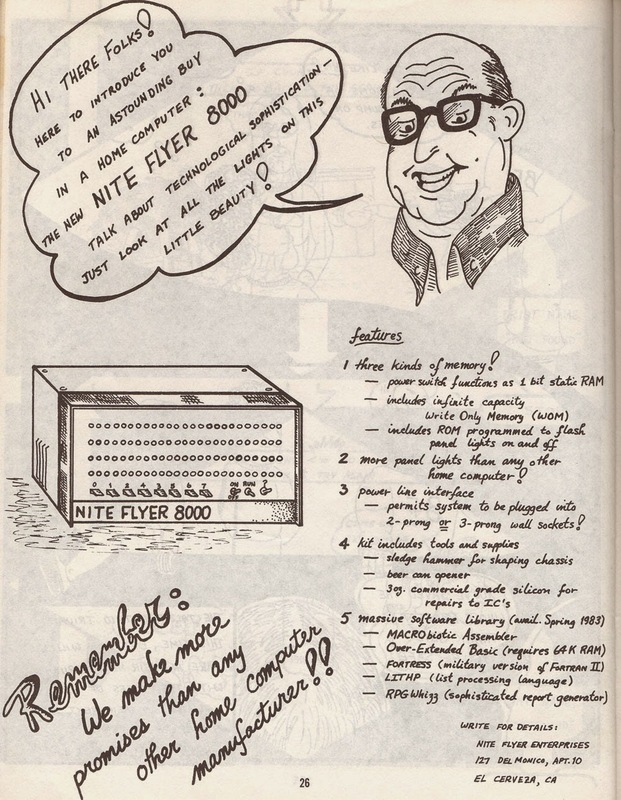 That reminds me, I do remember an article of "80 Microcomputing" a project to build a "micro front panel" for the TRS-80 which was just 24 LEDs slaved through a buffer to blink on and off as the address and data lines changed. If you don't want to bother with the input switches implementing the blinkenlights by themselves should be easy enough almost regardless of what CPU you build your homebrew out of. It seemed like the frontend consoles of some of the old big iron from the 60s and 70s had switches and blinkenlights like on the KA-10 and KL-10 for PDP-10 systems, but the hobby stuff does seem to be right at 1975 for panels. Switches and blinkenlights have a special place, probably mainly due to being a mainstay of scifi for decades, at least until TNG came around. Being able to control the processor and memory from switches on the front panel is just one of those things I'd like to be able to do. It's only really practical on the 8bit processors of the era, and even then the practicality is likely questionable. But still. I should be able to cobble together the hardware required for a serial terminal from parts on hand, bit banging a monochrome 80 column NTSC signal. Writing terminal emulation code is some kind of right of passage isn't it? Oh, man, if you don't have it already You should add this to your URL list. The laser-cut case is a thing of beauty. And there's also this, which is a miniaturized version of an actual trainer board that was sold back in early 1977. So much cool stuff. That zeta looks cool, but it looks like the guy says the instructions are incomplete and it's unlikely one could build a working replica from the available instructions. That OSI-300 replica looks awesome. Unfortunately, it looks like the guy isn't selling them (at least, unless you meet him in person), and hasn't made the PCB layout available. The schematic and parts list is all available, so it's possible to create my own PCB from that. Of course, the idea of keying in a 4K program is pretty darn crazy. For a discussion about Altair clones you should also consider the Altair Clone by Mike Douglas. That's what I'd spend my money on. The external look and feel is brilliant and the attention to detail with functionality is second to none. Unfortunatley the AltairKit while being a dedicated replica, has not been available for many years and last I heard the Briel Altair was not available for order either. Meh. The Altair Clone is certainly pretty but ultimately it's just an emulator. Title of thread: Altair clones, reproductions, etc? Sure... I just don't consider a machine built around a software emulator a "clone" or "reproduction" no matter how pretty its case is. Maybe reasonable people can differ on this point but in my opinion it's definitely not a "clone". To me the word "clone" implies a very close if not exact copy of the original hardware; taken to its extreme that means something like the Mimeo 1, but even if we just use it in the sense of, say, IBM PC compatibles it implies the use of the original CPU, expansion bus, etc. Machines like Briel's "Replica One" would still qualify as a technical "clone" to my mind since they still replicate the basic technical architecture of the original, despite also having practical advantages over 100% authentic replicas such as not impossible to find parts. But a PIC MPU wired up to some blinkenlights and running an emulator? Sorry, no. The whole point of an S-100 based computer is the expansion bus and the DIY hackery it invites. The "Altair Clone" is just exactly as authentic as one of those Atari Flashback consoles that looks real enough but is actually an emulator running on an ARM SoC. It's all window dressing. Not to say it isn't lovely and all, but it's fake. This is a spoof of the Altair, yes?